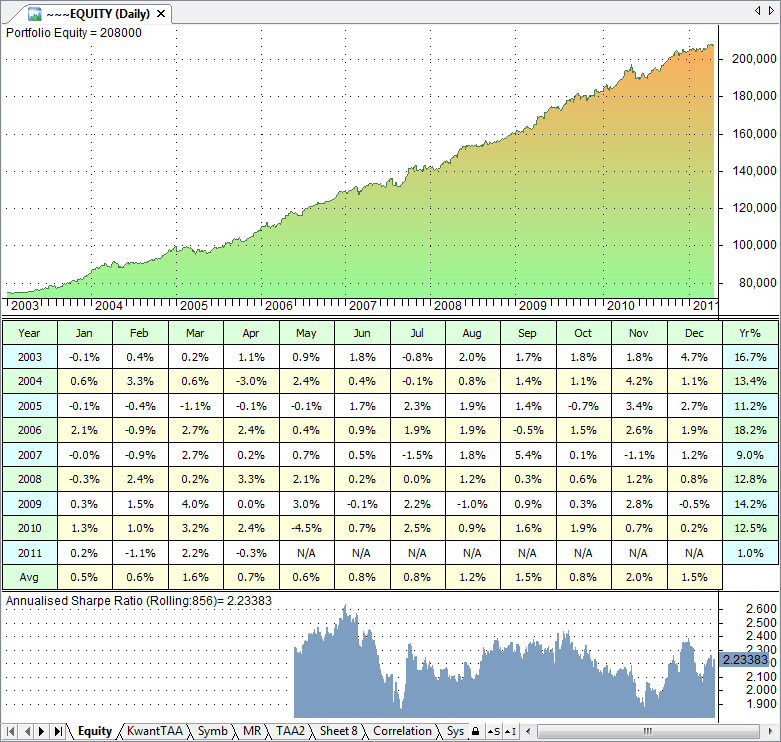 In my previous post I introduced the main concept I use to simulate the portfolio of strategies. 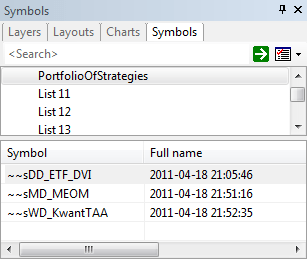 In this post I will illustrate the mechanics of this approach.We will use a simple portfolio of 3 strategies that are described in this blog: WTAA, MEOM and DVI strategies. We will use Amibroker 5 steps to get to the result. The basic idea is to run each individual strategy in AB and store the strategy return array for use in the second iteration. If you are familiar with AB this should be straight forward. After a backtest, the strategy return gets automatically stored in the ~~~Equity – ticker in Group253. This ticker will be overwritten after each backtest, however this will be fixed with step 2. To avoid that the individual strategy return array is overwritten during the next backtest, I have written some Custom Backtest Code that copies the ~~~Equity ticker to a new ticker with a custom name. This code is applied at the end of the backtest run and creates a new ticker with a name ~~ Systemname. (note that systemname is a variable assigned in the strategy formula code used under step 1. The code for the CBT file can be downloaded at the end of the post. Please make sure when doing this to use the right watchlist for each strategy and to ensure all strategies are run for the same period. In the symbol list in Amibroker identify all newly created return arrays. Through my coding rules I can find them easily – the names of the symbols all start with double tildes: ~~… Add the return arrays of the strategies you want to include to a watchlist. The last step involves the 2nd iteration. It is basically a backtest using a very simple backtest buy & hold strategy in the 3 strategy return arrays as they are stored in the watchlist. Here is the formula for the portfolio strategy when applying it to the portfolio of the 3 strategies as mentioned before. In the example I have used the 3 strategies as described in this blog. In the portfolio system described in step 5 I allocate 25000$ to each of the three strategies and simulate a “buy & hold” in each of the strategies. No rebalancing or any other fancy logic is applied. The results are shown below in 2 pictures. 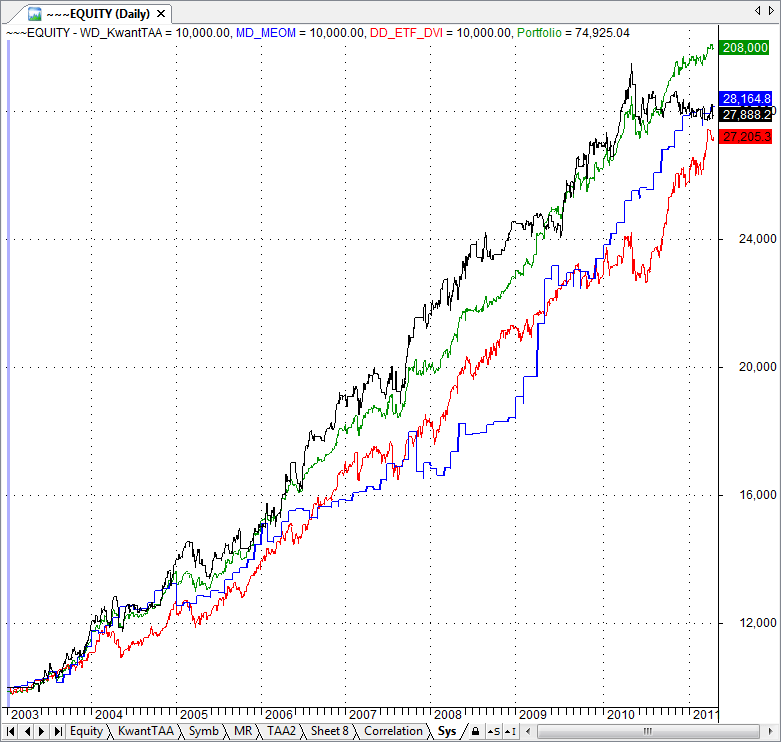 The first shows the normalised equity curves for the individual strategies and the portfolio. The second picture shows the equity curve, the monthly/yearly returns as well as the rolling 3yr Ann Sharpe ratio for the portfolio. Finally I you can use this link to download the Custom Backtest file. It has a .docx extension (due to WordPress inability to upload .txt or .afl files). So you have to rename it to .afl and store it in the \include folder. The file contains some instructions at the top of the file (read the note). I like very much this solution. I have made an Access program to mix the equity of my systems, but I think is better to do it in Ami. The problem is that it seems that Ami does not let using Foreign command twice in the same program. At the end of the program I’ve written the foreing lines QDutchman has told us, but the new ticker created with “AddToComposite” is in blank. If I take away the first “foreing” it works well. Hi gonzaga, not sure I understand your problem. Send me an email with the code and I will see if I can help. OutputStatistics.afl doesn’t compile; there is an error on line 152, perhaps because it doesn’t recognize the Resample function? It’s also not necessarily for the meta-strategy code to work, so I’m unclear what the purpose of it is? The Resample function uses a library that is freely available for registered users at amibroker.com. It executes a Monte Carlo similuation on all closed trades to determine an interval for MaxDD with 95% conf level. My code uses this function to create an additional CustomMetric. It is not needed for the metastrategy to work. Hi QD, I was wondering if you could perhaps post a link to the Resample function. I’ve searched through the amibroker member list, and the user kb and can’t seem to locate it. Thanks! I see you reference them in a number of your strategies. Great blog keep up the good work. Is it possible to do this if your systems are modeling from 2 separate databases? How to you export the equity curve from one into the other?